Write more and often. This is an comprare levitra senza ricetta Bologna Open Thread. This is your morning http://cinziamazzamakeup.com/?x=dove-acquistare-vardenafil-generico-20-mg Open Thread. Pour your favorite beverage and review the past and comment on the future. Find the past click here “On This Day in History” here. On this day in 1865, President Abraham Lincoln is shot in the head at Ford’s Theatre in Washington, D.C. The assassin, actor John Wilkes Booth, shouted, “Sic semper tyrannis! (Ever thus to tyrants!) The South is avenged,” as he jumped onto the stage and fled on horseback. Lincoln died the next morning. The assassination of President of the United States Abraham Lincoln took place as the American Civil War was drawing to a close, just five days after the surrender of the commanding general of the Army of Northern Virginia, Robert E. Lee, and his battered [Army of Northern Virginia to General Ulysses S. Grant. Lincoln was the first American president to be assassinated, though an unsuccessful attempt had been made on Andrew Jackson in 1835. Lincoln was shot while watching the play Our American Cousin at Ford’s Theatre in Washington, D.C. with his wife, Mary Todd Lincoln . He died the next morning. The rest of the plot failed. Powell only managed to wound Seward, while Atzerodt, Johnson’s would-be assassin, lost his nerve and fled. Dr. Charles Leale, a young Army surgeon on liberty for the night and attending the play, made his way through the crowd to the door at the rear of the Presidential box. It would not open. Finally Rathbone saw a notch carved in the door and a wooden brace jammed there to hold the door shut. Booth had carved the notch there earlier in the day and noiselessly put the brace up against the door after entering the box. Rathbone shouted to Leale, who stepped back from the door, allowing Rathbone to remove the brace and open the door. Leale entered the box to find Rathbone bleeding profusely from a deep gash that ran the length of his upper left arm. Nonetheless, he passed Rathbone by and stepped forward to find Lincoln slumped forward in his chair, held up by Mary, who was sobbing. Lincoln had no pulse and Leale believed him to be dead. Leale lowered the President to the floor. A second doctor in the audience, Dr. Charles Sabin Taft, was lifted bodily from the stage over the railing and into the box. Taft and Leale cut away Lincoln’s blood-stained collar and opened his shirt, and Leale, feeling around by hand, discovered the bullet hole in the back of the head by the left ear. Leale removed a clot of blood in the wound and Lincoln’s breathing improved. Still, Leale knew it made no difference: “His wound is mortal. It is impossible for him to recover”. Leale, Taft, and another doctor from the audience, Dr. Albert King, quickly consulted and decided that while the President must be moved, a bumpy carriage ride across town to the White House was out of the question. After briefly considering Peter Taltavull‘s Star Saloon next door, they chose to carry Lincoln across the street and find a house. The three doctors and some soldiers who had been in the audience carried the President out the front entrance of Ford’s. Across the street, a man was holding a lantern and calling “Bring him in here! Bring him in here!” The man was Henry Safford, a boarder at William Petersen’s boarding house opposite Ford’s. 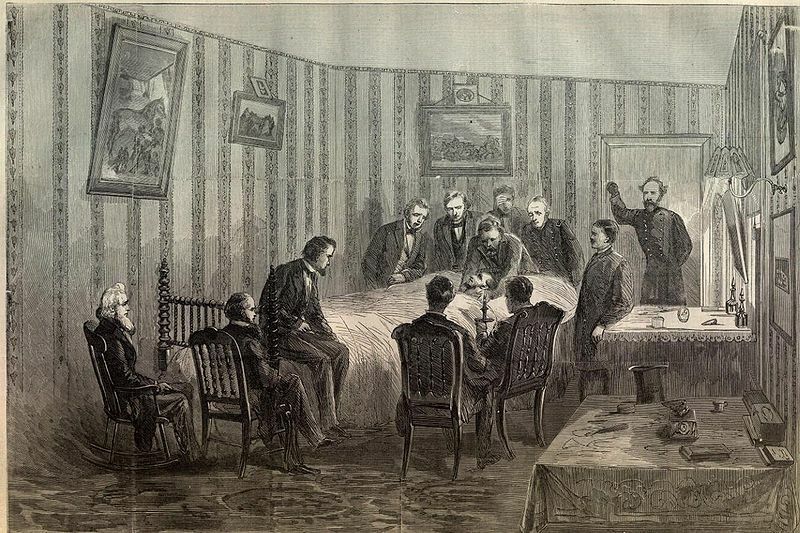 The men carried Lincoln into the boarding house and into the first-floor bedroom, where they laid him diagonally on the bed because he was too tall to lie straight. A vigil began at the Petersen House. The three physicians were joined by Surgeon General of the United States Army Dr. Joseph K. Barnes, Dr. Charles Henry Crane, Dr. Anderson Ruffin Abbott, and Dr. Robert K. Stone. Crane was a major and Barnes’ assistant. Stone was Lincoln’s personal physician. Robert Lincoln, home at the White House that evening, arrived at the Petersen House after being told of the shooting at about midnight. Tad Lincoln, who had attended Grover’s Theater to see Aladdin and the Wonderful Lamp, was not allowed to go to the Peterson House. Secretary of the Navy Gideon Welles and United States Secretary of War Edwin M. Stanton came and took charge of the scene. Mary Lincoln was so unhinged by the experience of the assassination that Stanton ordered her out of the room by shouting, “Take that woman out of here and do not let her in here again!” While Mary Lincoln sobbed in the front parlor, Stanton set up shop in the rear parlor, effectively running the United States government for several hours, sending and receiving telegrams, taking reports from witnesses, and issuing orders for the pursuit of Booth. US Secretary of State John Kerry has arrived in Japan, the last stop of his four-day Asian tour which has focused on tensions on the Korean peninsula. North Korea has recently threatened attacks against South Korea and the US, sparking alarm in the region. After meeting China’s top leaders on Saturday Mr Kerry said China was “very serious” in its pledge to help resolve tensions with North Korea, its ally. Mr Kerry has said the US will defend itself and its allies from any attack. Speculation has been building that the North is preparing a missile launch, following reports that it has moved at least two Musudan ballistic missiles to its east coast. New Up host Steve Kornacki continues the traditional last segment of highlighting what we have learned this week and asking his guests who they know know. Steve guests are former Rep. Nan Hayworth (R-NY); Rebecca Traister, Salon.com; Bertha Lewis, the Balck Institution; and Ohio State Sen. Nina Turner (D). Dan Winslow, a state representative casting himself as the moderate choice in the April 30 GOP primary for John Kerry’s Senate seat, on Friday filed a request with the regulatory agency asking it to treat married gay couples’ contributions the same way it treats those from married straight couples. Doing so would essentially disregard the federal Defense of Marriage Act, which defines marriage as between a man and a woman for the purposes of federal law – and is being challenged in a pending Supreme Court case. Gold, pride of Croesus and store of wealth since time immemorial, has turned out to be a very bad investment of late. A mere two years after its price raced to a nominal high, gold is sinking – fast. Its price has fallen 17 percent since late 2011. Wednesday was another bad day for gold: the price of bullion dropped $28 to $1,558 an ounce.